Joel Spring investigates the role of educational policy in the evolving global economy, and the consequences of school systems around the world adapting to meet the needs of international corporations. The new global model for education addresses problems of technological change, the quick exchange of capital, and free markets; policies to resolve these problems include "lifelong learning," "learning societies," international and national accreditation of work skills; international and national standards and tests; school choice; multiculturalism; and economic nationalism. The distinctive contribution Spring makes is to offer an original interpretive framework for examining and understanding the interconnections among education, imperialism and colonialism, and the rise of the global economy. He offers a unique comparison of the educational policies of the World Bank, the United Nations, the European Union, and the Organization for Economic Development and Cooperation. Additionally, he provides and weaves together important historical and current information on education in the context of the expansion of international capitalism; much of this information, gathered from many diverse sources, is otherwise not easily available to readers of this book. In the concluding chapters of the volume, Spring presents a thoughtful analysis and a powerful argument emphasizing the importance of human rights education in a global economy. This volume is a sequel to Spring's earlier book, Education and the Rise of the Corporate State (1972), continuing the work he has been engaged in since the 1970s to describe and analyze the relationship between political, economic, and historical forces and educational policy. "This book represents a unique perspective on education and the economy and shows how formal schooling around the world is increasingly becoming molded by corporations and their interests. It is clearly written and accessible to a wide audience, both academic and general. Highly recommended." "If the global economy is the new bad boy on the block, then Joel Spring makes a telling case that this kid is out to spoil the neighborhood..His thesis is that both diversity and human agency are being put at increased risk by the growth of a global economy. He makes a good case for this thesis and advances it with considerable evidence." "Joel Spring offers in this book a unique contribution to our understanding of the role education plays in the global economy. 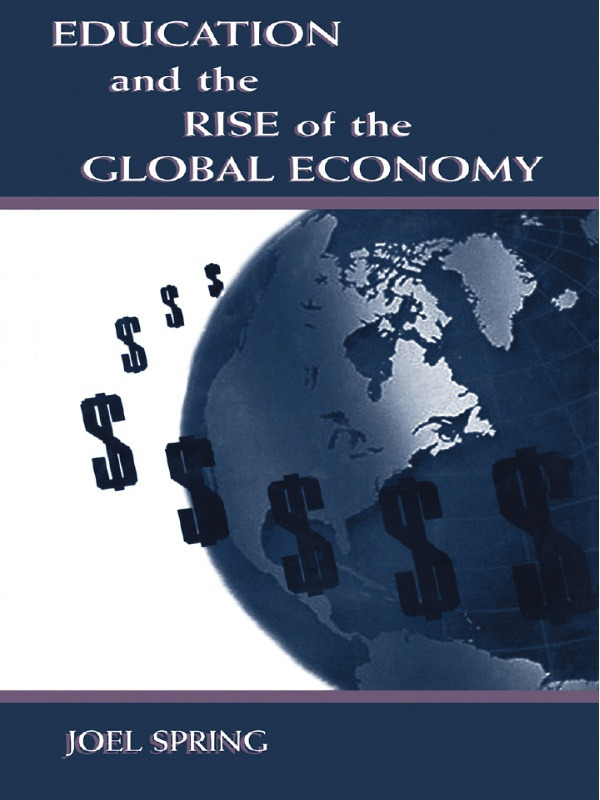 Whereas much of the literature and debate on globalization accepts the concept as unproblematic, Spring assures us that the globalization of education, in particular, is anything but unproblematic and neutral….Overall, this is a fine piece of work that compliments well Spring's other penetrating books into the history of educational policy." —The Journal of Higher Education "
"This powerful, honest, concerned, wide-ranging book demonstrates scarily how education is increasingly being shaped to fit a global economy dominated by corporate interests. It is an inspired synthesis that should trigger a reconsideration of how education should serve humans rather than humans serving economic purposes in an increasingly harsh and inhuman world." "A powerful critique of globalization and neo-liberal education initiatives. This book represents the kind of probing, uncompromising criticism that we have come to expect from Spring, arguably the most important educational historian writing today. Spring's new book is both an analysis of and a warning against the kind of tycoon, casino-style finance capitalism that is masquerading today as the spearhead of democracy. This book should be required reading in schools of education throughout the United States." "Think of what is lost in medicine and by physicians when, in only a decade or two, corporate America took over our health care. Now think what we are losing as they take over education and the profession of teaching. The bottom line--a term so much a part of corporate America--may be no less than a loss of democracy as we know it. Spring reminds us that education directed to a political life and for aesthetic appreciation may ultimately serve to preserve our democracy and our economy much better than education limited to the pursuit of high-wage jobs or toward maximizing returns on corporate investments." "The world's shift to an integrated global economy, coming at the same time as our shift to an information economy, has brought public education ever more forcefully to the forefront of each nation's, and the United Nations' agendas. Joel Spring's new book is exactly the right message at the right moment. Like it or hate it, its fundamental message is unavoidable. It should be required reading for anyone trying to understand and participate in the ongoing debates about public education in the U.S. and the world." "The value of this book lies not only in its linkage of educational policy and practice to current global economic policy, but I believe more importantly in its examination of the relationship between colonialism and education." "People of good conscience will read Joel Spring's latest work as a call for educational revolution. At present, the logic of global economization drives the policies and practices of state-mandated systems of schooling throughout the world. The message of such policies is clear. 'School is here to help you make yourself useful to the imperatives of global capitalism. Take advantage of its 'services' or forever suffer the consequences of modernized poverty and immiseration.' Spring challenges us to reconceptualize the purposes of education, to think of education as a fundamental human right that can aid people and peoples in defending themselves from the tyranny of transnational corporations and the threats that they pose to the cultural and biotic diversity of this planet." Contents: Preface. Education and White Love: The Foundation and Language of the Global Economy. Japan: Western Science, Eastern Morals. Singapore: Schooling for Economic Growth. The European Union. The United States and the United Kingdom: Schooling and the Free Market. OECD and the World Bank: Globalization of Human Capital Ideas. The United Nations: The Right to an Education in Human Rights? Conclusion: Education and the Global Economy.